LE-1 POWERMATE Stair Climber - Call us on 01285 741 150 for a hire quotation Today! The Powermate LE1 can be used as a powered stair climber, a powered tailgate lift, a balanced dolly and a loading dock leveller. 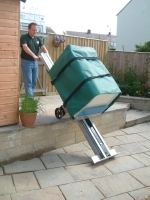 The LE-1 has a lifting capacity of 295kg and can be used to lift items such as AC Units, stoves, safes and fridges. One of the LE-1 Powermate Stair climbers main advantages is the fact that the machine has two drive screws instead of one. This enables the toe plate to move up or down the frame as required. The Powermate LE-1 stair Climber is also built with hand operated wheel brakes which stop the machine rolling forward, unless the break is released by the operator. WE OFFER A FULLY INSURED, EXPERIENCED AND QUALIFIED TEAM WHO COULD DO THE JOB FOR YOU, WE WOULD BE HAPPY TO QUOTE AND CAN SUPPLY JOB SPECIFIC RISK AND METHODS STATEMENTS AS REQUIRED SO PLEASE CALL OR E-MAIL FOR A PRICE TODAY. Contributes to jobsite safety, reducing injury and claims. The stacker feature allows for loads to be placed onto raised surfaces. Heavy loads can be moved using half the labour. Each Powermate LE-1 Stair Climber hired from Specialist Lifting Solutions Ltd comes with 1 x battery and 1 x battery charger unit. Please see our hire page for price details. All payments must be made by debit/credit card and two forms of I.D are required.